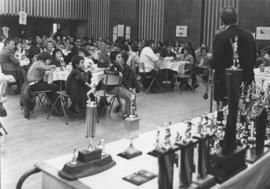 Photograph depicts youth and adults seated at banquet tables while a man speaks at a microphone. A table full of trophies is shown behind the microphone. Photograph depicts Arlene Brisker receiving a plaque from an unknown woman at a B'nai B'rith Women event. Photograph depicts Bernie Simpson shaking hands with a man identified as Andy. Bernie is awarding Andy with a 25 year pin. Written on verso: "Bernie / Andy - 25 year pin - Dec. 3/95". 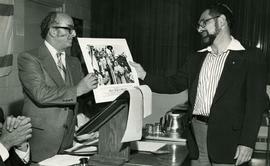 Photograph depicts Bernie Simpson awarding an unidentified man with a 25 year pin. Written on verso: "Bernie - 25 year pin - Dec. 3/95".